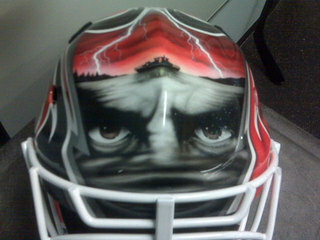 Cam Ward's got a new mask and there are pictures on the Carolina Hurricanes' web site. I really like the mask he's been wearing this season, but this isn't bad either. I like the whole Cape Fear theme. And what shooter wouldn't get a little freaked by the creepy eyes staring back at him?